The generation of pulses for the stimulus and control of electronic systems is beyond the capability of all but the most sophisticated of function generators. The architecture of a dedicated pulse generator enables it to generate pulses of a set width regardless of the repetition rate offering duty cycles which can extend down to 1 in 100 million. In addition to continuous operation, single or multiple pulses can be generated in response to trigger or gating signals with precisely defined timing relationships. A dedicated pulse-waveform output amplifier provides flat top pulses with fast rise and fall times at variable amplitude. 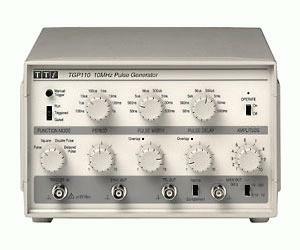 The TGP110 offers selectable delay between the sync output and pulse output. In triggered mode this also sets the delay between a trigger signal and the start of the pulse. The TGP110 can generate pulse widths in the range 50ns to 5s. There are eight overlapping decade ranges with vernier control within each range. The period range is 100ns to 10s, equivalent to a repetition rate range of 10MHz to 0.1Hz. Delay is independently adjustable over the same range as pulse width. A complement switch inverts the mark-space polarity. In square mode, squarewaves are generated at a frequency set by the period controls alone. This provides a convenient means of generating variable period edges where the pulse width is unimportant, for example. In double pulse mode, a second pulse is generated within every period at a set delay after the start of the first pulse. The delay is independently adjustable.